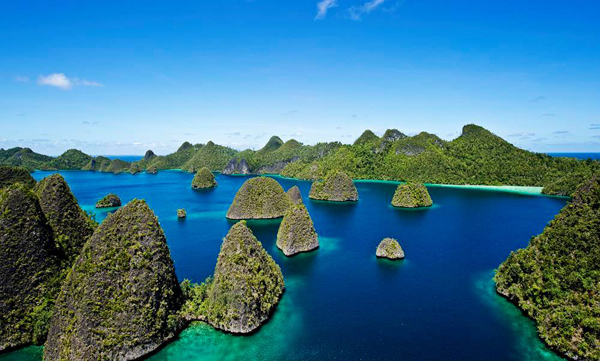 The majority of travelers recognize Raja Ampat Regency as the divers’ heaven. Why is that? Located in West Waigeo District, the island features some recommended sites for diving and snorkeling with tons of beautiful fishes and corals. Despite the long trip, visitors can enjoy beautiful nature in Wayag. That means it is a worthy vacation, as the island provides many options of fun activities to tourists. These include snorkeling, diving, sightseeing, and photography. It is even popular among foreigners, especially professional divers. In terms of beauty, Wayag Island shares similar beauty to the other islands in Raja Ampat Regency. That means it features some small reef islands and Tosca seawater. Not to mention the island has lots of bushes and trees with serene nuance. Due to this reason, the island becomes tourists’ favorite choice to eradicate stresses. Thanks to a secluded environment. When it comes to the nautical beauty, Wayag is one of the best dive sites in West Papua Province. No wonder, both beginners and professional divers often come to Wayag. The visibility of the sea is quite excellent, after all. Diving is the most popular activity in Wayag Island. The thing is visitors should carry their own gears prior to reaching the island. It is possible to rent the gear in either Sorong or Waisai City. The price is a little bit expensive, though. Once tourists get in the water, they might see stunning corals with different colors and shape. The seawater’s color is pure blue and it has top-notch visibility. No one would regret it, for sure. Even beginners can enjoy such adventure wholeheartedly. The next activity is sightseeing. Wayag Island features several small karst islands, on which tourists can witness. Most of the time, visitors may take some pictures of them. The locals call them “Pulau Karang”. The fact is that almost all islands in Raja Ampat Regency own such features. Apart from sightseeing, tourists have the chance to climb those hills. The hiking takes about 30 minutes, but it becomes an irreplaceable experience for everyone. Not to mention the views are breathtaking from above! Some people say Wayag Island is the icon of Raja Ampat Regency. They even claim that island has the best landscape for photography. Well, they are not wrong, as Wayag has some perfect spots to capture excellent pictures. Even a smartphone will be sufficient to take those majestic views. For professional photographers, it is better to carry a good camera with ranged-lenses. Also, a tripod will be a good extra. Apart from the sea scenery, both sunrise and sunset also become good backgrounds for photography! So, how can tourists reach Wayag Island? From Jakarta, they need to take an airplane to Sorong City. The name of the airport is Domine Eduard Osok or DEO. From there, the next destination is Sorong Port. The last trip may involve a speedboat and it takes much money. Not to mention it takes much time, which is about 5-6 hours.